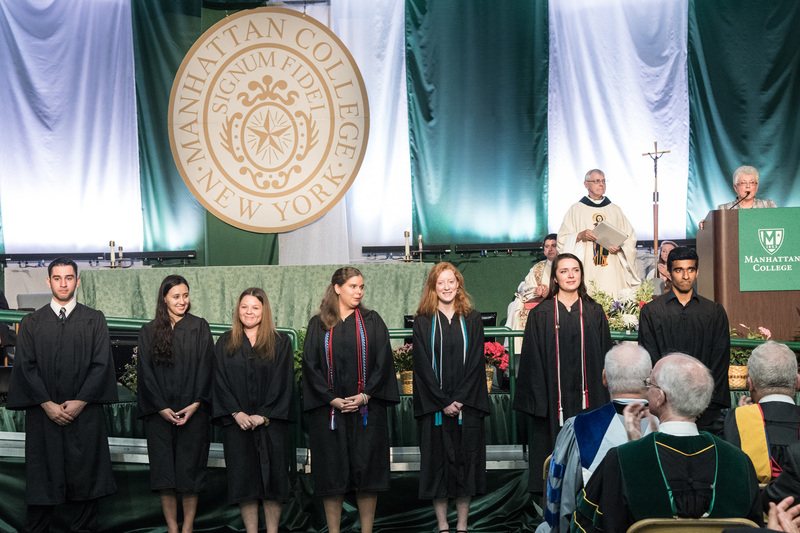 After graduating on May 17, seven recent Manhattan College graduates will embark on new service positions in a variety of roles. Three will join Lasallian Volunteers across the United States and other individuals will join Jesuit Volunteer Corps, Americorps, the Ameson Foundation and the Cathedral Seminary. Kelly Cousins (Burnt Hills, N.Y.) double majored in sociology and peace studies. At Manhattan, she was a member of JustPeace, the Film Society, Manhattan College Players and was a Writing Center tutor. Cousins will teach English in China with the Ameson Foundation. Charlene Frankini (Queens, N.Y.) received a bachelor’s degree in elementary education. She was a member of Kappa Delta Pi and completed field work in integrated learning with children in grades 1-3. Frankini will join the Jesuit Volunteer Corps to teach second grade on an Indian reservation in Montana. Kaylee Gendron (Newmarket, N.H.) received a bachelor’s degree in marketing. A member of the College’s Entrepreneurship Club, Gendron will serve Americorps as a community engagement coordinator with children in Portsmouth, N.H.
Sheena Mullan (Queens, N.Y.) was a communication major. She will join the Lasallian Volunteers to serve at the Catalyst Schools in Chicago as an instructional assistant. A member of the senior class gift committee, Mullan was a resident assistant her senior year and a member of the Alpha Delta Sigma Honor Society. Lindsey Pamlanye (Ronkonkoma, N.Y.), who majored in secondary education at Manhattan, will also join Lasallian Volunteers. She will teach and mentor students at St. Raphael Academy in Pawtucket, R.I. A Writing Center tutor and resident assistant, Pamlanye was highly active with Campus Ministry and Social Action. Savio Paul (Yonkers, N.Y.), a chemical engineering major, will enter Cathedral Seminary where he will begin studies for the priesthood. A member of Manhattan’s track and field team, Paul was a mainstay on the MAAC All-Academic team throughout his career. John Tudisco (Massapequa, N.Y.), a civil engineering major, will move on to a position with Lasallian Volunteers in Tucson, Ariz., where he is planning to be a student support coordinator at San Miguel High School. The senior class president and a two-year resident assistant, Tudisco was also an admissions tour guide and the student body’s representative in the Alumni Society.